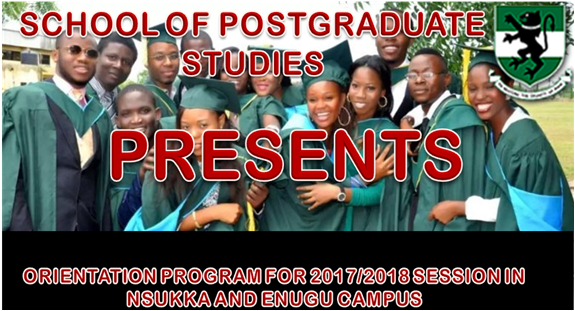 The School of Postgraduate Studies is organizing an orientation programme for all fresh postgraduate students admitted in the 2017/2018 academic session into departments in both Nsukka and Enugu Campuses of the University. This is in line with the vision of the current University Administration to reposition the postgraduate programmes for global competitiveness through timeliness, excellence and ethical conduct. This orientation programme is a proactive enlightenment effort to acquaint the students with the necessary procedures and regulations and motivate them onto high level performances that will minimize cases of delayed graduation, failures and other mistakes that could arise from ignorance.